Recently released data is a feather in Afrezza's cap, but will it be enough? What: Shares of MannKind Corp. (NASDAQ:56400P706), a commercial-stage diabetes drug and device maker, gained 17% last month, according to data from S&P Global Market Intelligence. More data showing the rapid action of its inhaled insulin Afrezza boosted investor confidence during a month the iShares Nasdaq Biotechnology Index, of which MannKind is a small component, took an 8.5% tumble. So what: While June was a great month for MannKind's stock price, it has been a rough year for longtime shareholders. After the beating MannKind stock took when it heavily diluted shares recently, the stock is down 20% since the beginning of May, and 78% lower than it was a year ago. Last month's gains came several days after the company presented some data comparing Afrezza to Eli Lilly's Humalog at the annual meeting of the American Diabetes Association. Although there wasn't any mention of statistical significance, results from a 30-patient comparison study with adult Type 1 diabetics suggest Afrezza's onset of action occurs within 16 to 21 minutes, while an investigator determined the equivalent dose of Humalog took 45 to 52 minutes. Also encouraging were duration of action numbers: Afrezza continued acting two to three hours shorter than its competitor. There are at least 22 million diagnosed diabetics in the U.S., and about 5% of adults have the Type 1 variety. Many Type 1 and advanced Type 2 patients use a fast-acting insulin before meals, and Afrezza's rapid action and short duration should make it the leading option for pre-meal insulin users. It begins quickly enough that patients can use it as they sit down to eat, and its shorter duration should reduce risk of hypoglycemia, a dangerous condition that arises when insulin levels remain high for too long after meals. Now what: Lilly reported worldwide Humalog sales of $2.84 billion last year, so the excitement seems justified. 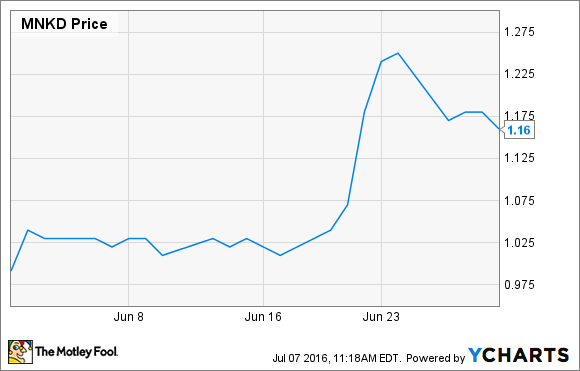 With a market cap less than $430 million, MannKind stock began June looking like a bargain (on the surface, at least). While the company only needs to reach a fraction of its addressable population to justify its price, Afrezza is still hamstrung by a black box warning on its label. Warnings that MannKind's only marketable product may cause dangerous tightening of airways in patients with lung conditions is a huge barrier to break through. Before beginning treatment with the drug, physicians and patients must jump through several hoops to prove their lungs are suitable, and ongoing lung testing is required. MannKind has addressed the issue by arming its salesforce with devices physicians need to perform some of the testing. The fact that this wasn't part of Sanofi's strategy when it first launched Afrezza is a head-scratcher, and its inclusion during the upcoming relaunch should help. Arming its salesforce with equipment and comparison data are steps in the right direction, but MannKind's financial clock is ticking. It ended the first quarter with just $27.7 million in cash and equivalents, and lost $24.9 million during the same period.The stock offering that resulted in May's losses added an estimated $47.5 million to its coffers, but the company reported $249.2 million in current liabilities -- the type due within 12 months -- at the end of March. If the Afrezza relaunch set to begin soon isn't a rousing success, MannKind is facing solvency issues. Remember, no matter how low the stock price seems now, it can continue falling until it hits zero.